PULP OBSCURA, an imprint of Pro Se Productions, proudly presents new tales of classic Pulp’s Masked Mistress of the Range in THE NEW ADVENTURES OF SENORITA SCORPION, now available as a top quality audio book produced by Radio Archives! Created by Les Savage, Senorita Scorpion is in fact Elgera Douglas, a young lady who became a legendary outlaw defending her family's land and legacy, the fabled Lost Santiago Mine. Beautiful and deadly. A crack shot. A Fast thinking, daring fighter who is ruthless to those who threaten the land and people under her protection! 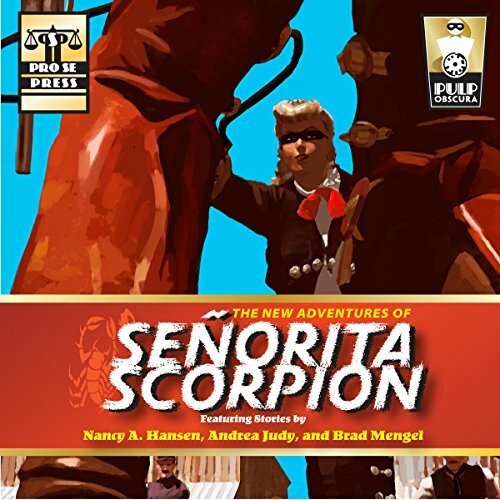 Nancy A. Hansen, Andrea Judy, and Brad Mengel bring a classic Pulp character galloping back to life as Senorita Scorpion rides again in three daring tales of hard riding action and bold adventure! THE NEW ADVENTURES OF SENORITA SCORPION is available at Amazon and www.prose-press.com.